Improvements in the selected line in the Line Fitting table. Ability to delete a blind region without right clicking. Multiplets ranges will not overlap when using automatic Sum or Edited Sum methods. Ability to add more than 10 handlers to the selected regions in Data Analysis. Improvements in the response factor options for concentration graph in Data Analysis. 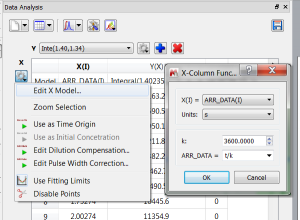 Data Analysis X-axis model to easily interconvert sec/min/h. Capability to display the Integral calculation method in the ‘Integrals Table and Label’. The active document remains when closing an inactive document. Allow to select the Mnova version in the Settings Object. Extend the funcionality of QTableWidgets to get the currentRow and the currentItem. Improvements in the ‘Import Directory Stack’ script. Scale Image in a Label Respecting the Ratio. More functions to operate with pages. Comment not read when the process number was not 1 (from Bruker). Data Browser did not recognize JEOL .jdf files. Incorrect number of points, group delay export. 1D spectra from ACD could not be imported via script (Mac). Lock icon was missing in Line Fitting table when locking any value (Mac). Horizontal trace misaligned with the 2D spectrum after making some cuts (Mac). Choice of 15N Ξ Value was not persisted. Problems changing the position of the vertical scale in a 2D spectra. Problems selecting advanced option in Apodization dialog (Mac). Problems in Gaussian GF apodization for 1D and 2D spectra. HSQC NUS spectra from Bruker with specific TD(1) values could not be processed. Last Peak Picking and Integration options got always applied. Problems removing a TD region. After applying GSD peak picking the processing template showed Standard options. Series of spectra in a single DAT file from old Nicolet format got opened as one spectrum. Problems opening a Fid with DTYPA parameter. Error of unknown format when loading spectra in old Ge Nicolet format. Incorrect default processing applied when loading .td files from Nanalysis. Problems loading old Mnova documents. Time Domain: Quantitation: no more highlights the integration region. Problems applying a forward LP with Toeplitz method. Problems with Standard peak picking of both positive and negative. Mouse cursor and cross-hair positions did not match in stacked with a non-zero stack angle. Problems closing Apodization window from a document previously closed. Only one Apodization window should be opened after calling “W” several times. Button showed cut off in Spin Simulation panel (Mac). Multiplet Report Parser failed when NMR Plugin was not active. Reference Deconvolution applied only to the active spectrum in a stack. 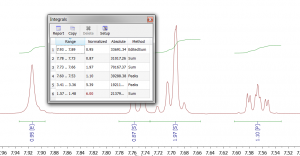 19F spectrum from Bruker appears distorted when loaded in Mnova. Problems with the New Spectrum feature of the Line Fitting. Incorrect Forward LP default value. Unexpected multiplet integral values after being generated from integrals and modified the ranges. Report of the ‘unknown compounds’ did not work. Assignment report script failed to report H and C assignments. Reference shortcuts (L and R) did not work if the toolbar icon was not visible (Mac). 13C assignments could not be displayed in a molecule with changed atom numbering. Some 2D peak labels are showed crossed. Automatic Integration (Peaks method) detected integrals including only Impurity peaks. Multiplet analysis applied again after having already selected. Labels of rows in Js table of Spin Simulation showed cut off. Problems updating the Server Prediction Database. Prediction failed with phosphonium salts (Mac). Chemical shifts of Assignments were not visible after being stored in a DB. Part of the icons missing from the peak search modes. Peak labels displayed out of the box. Cursor in a text not moving or displaying correctly when trying to edit the text (Mac). Wrong document name when printing to PDF. Problems displaying all the pages of a document in the page navigator. Space Needed – Remainder License Message. Same page uuid problem when loading same .mnpag file several times. No molecule gets opened when loading a ChemDraw file (.cdx). Verification quality of documents with verification results showed always in green. Molecules Table: Last molecule property can not be deleted. Problems displaying 3D Molecule viewer (Mac). Atom annotations could not be displayed by default for the whole molecule. Atom numbers with ” ‘ ” not displayed. Problems opening document with two equal molecules. Cannot data decimate on an Agilent ser file. Atom numbers did not display in Mestrenova on kubuntu 14.04LTS.